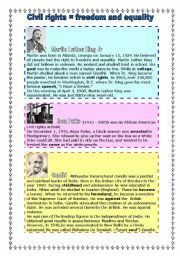 This activity is a reading about 3 important people that fought for civil rights. 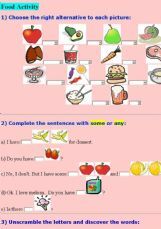 It includes reading comprehension activities and also simple past exercises. I used this worksheet to accomplish a given unit about making a difference and respecting the others. It includes some vocabulary study, a little research work and song listening/filling in the blanks activities. The answer key is included. Hope it is useful. 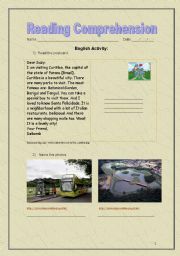 It is a reading about the city of Curitiba in the shape of a postcard and some comprehension activities. At the end, the students have to write a postcard with information about their city. 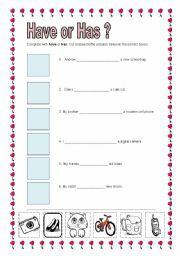 This activity was made to practice the simple present tense of the verb to have. It is also a cut-and-paste activity where children match pictures and sentences. It was made as a consolidation game dealing with feelings. This is the first part. Elementary level. 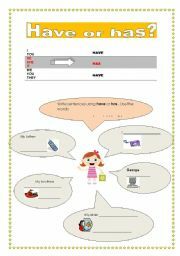 This worksheet aims to practice the spelling of some action verbs and the use of the modal can. The students try to discover the verbs looking at the pictures in the crossword. 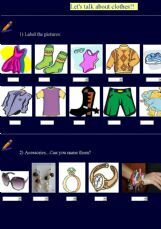 This activity provides a simple table of the simple present of the verb to have in the affirmative form and the students fill in the sentences according to the rules. This is the second part of the consolidation game about feelings. Elementary level. 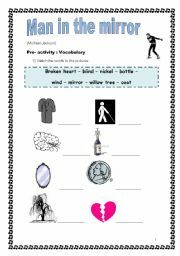 This activity was created to reinforce the simple past of some irregular verbs that my students were studying. This activity is about food vocabulary and reinforcement of some/any. 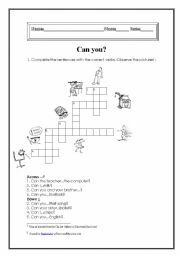 It is a reinforcement activity using Present Progressive (Continuous) for elementary students. 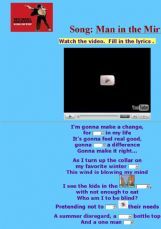 Listening exercise and reading of a short biography of Israel Kamakawiwo�Ole (IZ), a famous and talented Hawaiian musician.New video included. 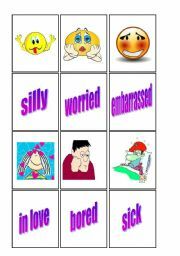 This is a simple activity to reinforce the past continuous tense.Elementary level. 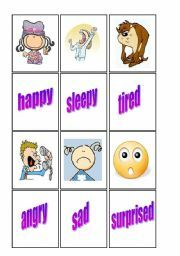 It is an exercise to practice the verb to be and vocabulary related to jobs. Elementary level. 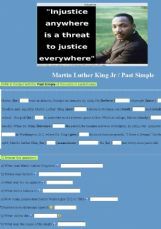 It is a simple reading about Martin Luther King Jr focusing on the simple past tense. 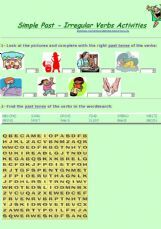 It contains fill in the blanks exercise, questions related to the text and a wordsearch activity. Elementary level.